According to the latest figures from the CNTC, there are currently a total of 108 people subject to judicial proceedings in connection with this case. 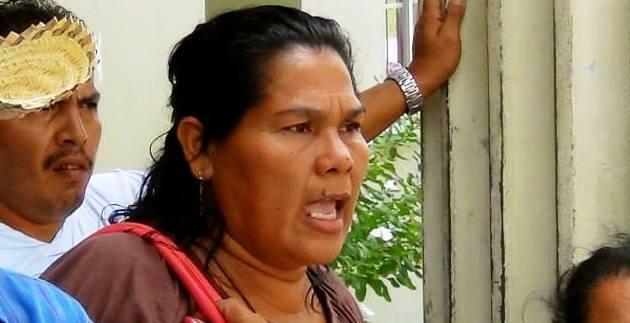 Magdalena Morales was arrested on 26 July 2013 in her office and, in a case with close parallels with that of the COPINH leadership, charged with usurping land. As a result of the alternative measures to imprisonment, she is unable to visit the area under dispute, seriously affecting her work in support of the campesinos. Another of the people affected, Félix Torres Meraz, aged 65, has been under house arrest since June3 and has to sign regularly at the court-house, which he has been unable to do recently because he has pneumonia. The court has threatened to imprison his daughter if she fails to sign in his place. As well as this judicial persecution, Magdalena and others have also suffered death threats and surveillance. According to Magdalena, at the second ‘conciliation’ meeting on 2 December, Víctor Ramos, the chairman of AZUNOSA himself, told her to “cuídese el pellejo” (“watch her back”). At the meeting on 29 January, AZUNOSA’s lawyers focused on the Supreme Court verdict which found in AZUNOSA’s favour.4 Although it was issued on 9 December 2013, it was apparently not made public until 20 December, leaving little time for the campesinos’ legal team to react. In the end, they lodged an appeal against the judgment on the grounds of unconstitutionality (recurso de amparo). The Supreme Court judgment endorses the National Agrarian Council’s ruling, in November 2012, which overturned the decision made by INA (National Agrarian Institute) in March 2012 in favour of the campesinos. INA had ruled against AZUNOSA because its land holdings in Agua Blanca Sur exceed the ‘sobretecho‘ – the ceiling imposed under Article 25 of the Agricultural Reform Act and continued under the LMDSA (1992 Agricultural Sector Modernization and Development Act), restricting land ownership to 250 hectares in the Sula Valley. AZUNOSA has argued that the purpose of the LMDSA was to discourage the accumulation of idle land for speculative purposes and was not intended to be used against farms in full production, claiming that this is made explicit in the preamble of the LMDSA. (The preamble actually stresses the importance of food production and food security – AZUNOSA has a contract with Coca Cola and SABMiller, its owner, is a beer company). AZUNOSA argues that it was on that basis that SAG (Ministry of Agriculture and Cattle-Rearing) had formally granted it a waiver from the sobretecho. The European Union has introduced a trade pillar into its Association Agreement with Central American countries, applied in Honduras since August 2013, which means that the bilateral investment treaty between the UK and Honduras will ultimately be replaced by an EU one, if that has not happened already. However, in the final article of the existing treaty there is a ‘sunset clause’ under which investments made while it is in force will continue to be subject to the treaty’s provisions for 20 years after it has been terminated. In the meantime, Magdalena and the campesinos she supports remain in a legal limbo and continue to receive threats. 1SOAWatch article The Struggle for Land in Agua Blanca Sur provides extensive background on the case. 6 El Heraldo Consejo Nacional Agrario falla a favor de Azunosa.